Experimental study of the morphine de-addiction properties of Delphinium denudatum Wall. Our aim was to explore the de-addiction properties of Delphinium denudatum Wall. in morphine dependent rats. Charles Foster male albino rats were made morphine dependent by injecting morphine sulphate in increasing doses twice a day for 7 days. The spontaneous withdrawal signs observed 12 h after the last dose were quantified by the 'counted' and 'checked' signs. The drug (alcoholic extract of Delphinium denudatum) was administered p.o. in different regimen: a) single dose (700 mg/kg) 10 h before the first dose of morphine, b) single dose (700 mg/kg) 10 h after the last dose of morphine, c) multiple doses (350 mg/kg) along with morphine twice a day for 7 days. 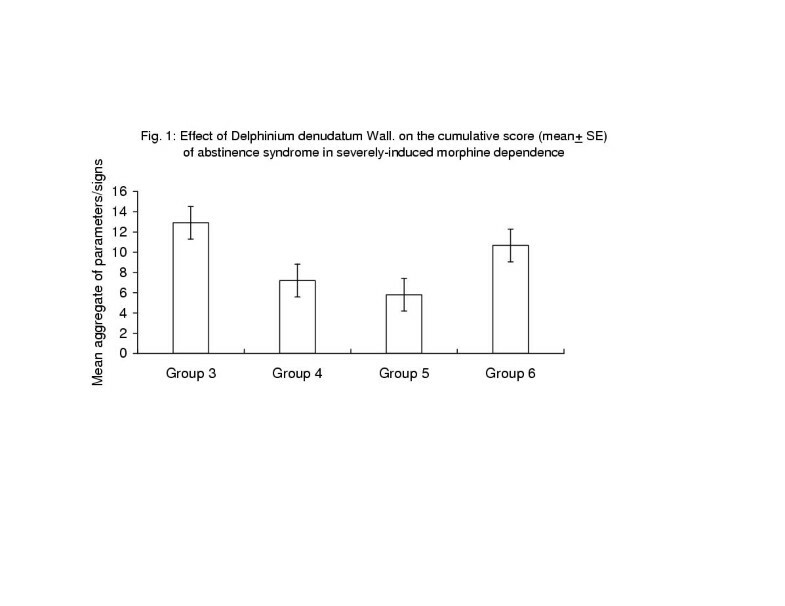 Administration of Delphinium denudatum extract caused significant reduction in the frequency of counted signs as well as the presence of checked signs of morphine withdrawal. The maximum reduction was observed in regimen 'b' followed by regimen 'c' and 'a'. Delphinium denudatum Wall. significantly reduces the aggregate scores for all parameters in morphine withdrawal syndrome by central action and thus may prove to be an alternative remedy in morphine de-addiction. Delphinium denudatum Wall. (Jadwar, family; Ranunculaceae) is found on the outer ranges of western Himalayas from Kashmir to Kumaon. It is one of the most important drugs used in the indigenous system of medicine in India, especially in Unani Medicine. The roots are reported to be useful in a variety of ailments such as aconite poisoning, brain diseases, fungal infection, piles and toothache as analgesic and astringent [1–3]. Its use in opium addiction is mentioned in some classical literature [4, 5]. A number of studies have been done on its phytochemical and pharmacological properties [6–8]. Its de-addiction property in moderately induced morphine dependence was first studied and reported by us . The study was further extended to explore the suppression of withdrawal signs by D. denudatum in rats during severely induced morphine dependence. Seven weeks old male albino rats of Charles Foster strain (100–150 g) were used. The rats, purchased from JNMC Animal House, Aligarh, were housed in groups of eight in standard cages with free access to solid pellet diet (Gold Mohar, Lipton-India, Ltd.) and tap water except during the time of experiment. The "Animal Observation Room" was controlled so that the light dark cycle (light period 6.00 am to 6.00 p.m.; 12 hours) and temp. (23 ± 2°C) were nearly constant. The study was approved by the JNMC Animal Ethics Committee. Morphine sulphate (Sigma Chemicals Co., USA). Delphinium denudatum Wall. (D. d). The tuberous roots of D.d. in the dried form were procured from Dawakhana Tibbia College, Aligarh Muslim University, Aligarh. These were identified by comparison for macroscopic and microscopic characters with authentic specimens of D. d. kept at the Botanical Survey of India and the Forest Research Institute, Dehradun. Due to the presence of various alkaloids in roots, the extraction was carried out by mixing the powdered roots with 1:3 w/v in absolute alcohol by Soxhlets apparatus for 72 hours. Yield of extract was 7.43 % w/w in terms of dried starting material. It was sticky in character, pilular, brown and of pleasant smell. Group 4: D. d (350 mg/kg, p.o., twice daily) along with Morphine (10 – 100 mg/kg). Group 5: D. d. (700 mg/kg, p.o., single dose) 10 h after the last dose of morphine. Group 6: D. d (700 mg/kg, p.o., single dose) 10 h prior to the first dose of morphine. The morphine abstinence syndrome, on which the assessment of physical dependence of morphine was based, consisted of a variety of motor and vegetative signs. The signs of spontaneous abstinence syndrome were recorded 12 h after the last dose of morphine for 30 min in a clear perspex acrylic box of 35 × 22.5 × 13.75 cm. Similar observations were also done in D. d. and Saline treated groups. The 'counted signs' and 'checked signs' were multiplied with the respective 'weighing factors' Table 2 (see Additional File) for evaluation of the severity of abstinence syndrome using a modified methods of Blasig J, et al. and Neil & Sparber [11, 12]. In group 1, which was treated only with saline, there were occasional episodes of chewing, exploring, digging and yawning at the time of observation. Group 2, administered with D.d. in dose of 350 mg/kg twice daily, also showed occasional but inconsistent signs namely chewing, exploring, yawning, squeaking on touch which were comparable to group 1. Group 3 which was given only morphine in increasing doses (10 – 100 mg/kg) displayed signs of severe morphine dependence observed 12 hours after the last dose. These animals showed head shakes, digging, teeth chattering, jumping, wet-dog shakes, writhing, squeaking on touch, hostility on handling, eye twitching and lacrimation while there was multifold increase in chewing, exploring, digging and yawning as compared to groups 1 and 2. In group 4, in which alcoholic extract of D. d. in dose of 350 mg/kg was given alongwith morphine showed reduction in the withdrawal signs of morphine dependence as observed by lower values of checked and counted signs when compared to morphine treated group 3. Animals of group 5, which were administered with single dose of alcoholic extract of D. d. (700 mg/kg) 10 h after the last dose of morphine, i.e. 2 h before the time of observation, showed marked reduction in the appearance of withdrawal signs of morphine dependence. The values of counted and checked signs were significantly reduced in all observed parameters as compared to group 3. In group 6, administration with single dose of alcoholic extract of D. d. (700 mg/kg) 10 h prior to the first dose of morphine, caused a reduction in the development of morphine dependence as compared to group 3. The reduction in cumulative scores of counted and checked signs was maximum in group 5 followed by group 4 and 6 (Table 3 see Additional File). The mean aggregate score of 12.9 ± 2.5 in morphine-treated animals (group 3) was reduced to 7.2 ± 1.7, 5.8 ± 1.5 and 10.6 ± 1.9 in the animals of group 4, group 5 and group 6, respectively (fig 1). The study was conducted to evaluate the ability of D. d. to suppress the signs of withdrawal in morphine-dependent rats. In our set up, we could observe only nine counted signs, viz. chewing, head shakes, exploring, digging, yawning, teeth chattering, jumping, wet dog shakes and writhing, and four checked signs, viz. Squeaking on touch, hostility on handling, eye twitching and lacrimation out of all signs mentioned in Table 2. Similar propensity of withdrawal signs was reported by other workers [10, 11], who also observed that certain signs were more prominent with less dependence and disappear as the degree of dependence increases, while other signs emerge . Further, it has been observed that the intensity of tolerance and precipitated withdrawal in rodents is a function of the dosage and the interval of administration of morphine . Administration of morphine in increasing doses caused development of severe dependence, which was confirmed by observing withdrawal signs after 12 h of the last dose of morphine. A reduction in the severity of the abstinence syndrome was observed in group 4, 5 and 6, which were treated with alcoholic extract of D.d. alongwith morphine in different dose regimens. The maximum reduction in withdrawal signs was observed in group 5 in which the drug (D.d.) was given in single dose (700 mg/kg) 2 h prior to the time of observation or 10 h after the last dose of morphine. The scores for chewing, exploring, digging, yawning, teeth chattering, hostility on handling, writhing and eye twitching were significantly decreased (p < 0.001) whereas the score of headshakes, Squeaking on touch, wet dog shakes and jumping fell to zero. In group 4 and 6, where the drug (D.d) was given in multiple doses (350 mg/kg twice daily × 7 d) and single dose (700 mg /kg) once 10 h before the first morphine dose, respectively, the reduction in withdrawal signs was less as compared to group 5. The drug appears to act on sites other than opioid receptors because it neither caused development of dependence as observed by absence of withdrawal signs in group 2 nor it ameliorated the signs of abstinence syndrome in group 4 to the extent as it did in group 5. The drug appears to act centrally independent to opioid receptors. Moreover, the principal alkaloid of Delphinium genus, methyllycaconitine (MLA), has been reported to have a blocking activity at alpha 7-type neuronal nicotinic receptor. A series of C-19 diterpenoid alkaloids purified from Delphinium are reported as inhibitors of α-bungarotoxin binding to rat and housefly neuronal membranes . MLA, isolated from Delphinium seeds, inhibited acetylcholine and anatoxin induced whole-cell currents in cultured fetal rat hippocampal neurons, which was concentration dependent, reversible and voltage dependent . The distribution of MLA, a non-diterpenoid alkaloid, binding sites in rat brain has been reported: high density in hippocampus and hypothalamus, low density in striatum and cerebellum . MLA has also been reported to produce nearly complete functional blockade of nicotinic receptors located at Edinger Westphal neurons in chick. MLA inhibits κ-bungarotoxin sensitive nicotinic receptor in ciliary ganglion. MLA binds most avidly to α-bungarotoxin site in brain and is 200 fold less potent at muscle nicotinic receptor . The exact sites and mechanism of action of Delphinium denudatum needs further evaluation. The extract seems to have a rapid onset and long duration of action as evident from the results of group 5 and 6 respectively. In the light of the above findings, the drug significantly reduces the aggregate of scores for all parameters showing striking attenuation of severe morphine withdrawal syndrome. Thus, the drug may prove to be an alternative remedy in morphine de-addiction.